For the diverse requirements of our clients we are involved in offering an extensive range of Cup Washer. 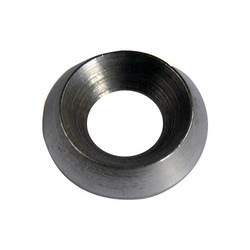 These find various applications in electrical industries, electronic and many more. We offer these to our clients in different sizes have rugged construction also. In addition, we also assure timely delivery of our products to meet the customers needs. Our company "M.R Forging & Engineering Works " holds an expertise in the manufacturing, trading and supplying a wide range of Hexagonal Bolts, Nuts Series, Hexagonal Nuts, Metal Screws, Inconel Stud Bolt, Stainless Steel Rod, Inconel Sheets, Industrial Pipes, Industrial Tubes, Coating Studs, U Bolt, Titanium Nuts, Steel Nuts, Industrial Fastener & High Pressure Washers. In such s short span of time we have created a niche at work and our fasteners are catered to many industries like chemical, paper, sugar and other industries. Following a customer-oriented approach has successfully helped us to achieve a name in the industry of fasteners.We are backed by sound infrastructure and well equipped manufacturing unit which has been the biggest reason behind our impeccable and flawless range of fasteners.